There haven’t been many concert reviews yet on Make Your Own Taste, but our intrepid contributor Thomas is quickly rectifying that with this series of prog-related gig reviews. My brother-in-law Colin is a big prog fan, huge, in fact. He talks about prog bands with the same geeky abandon that my friend Steven speaks about comics, and with the same reverence too. I love progressive music but would never consider myself on a par with Colin — he is the prog master and I am his padawan. With this in mind I approached Pendragon’s gig at the Ferry in Glasgow on the 6th of November with equal amounts of enthusiasm and trepidation. Whilst I knew of Steve Rothery, whom we went to see the night before, and had thoroughly enjoyed his solo album … Pendragon was different: I knew nothing of them and my thoughts on the album they were touring, Men Who Climb Mountains, were more mixed. Let me take a moment to explain why my initial thoughts were mixed: I didn’t initially engage with the vocals of Nick Barrett, and while I really connected with Barrett’s guitar playing and the music created by Peter Gee on bass, Clive Nolan on keyboards and Craig Blundell on drums, I couldn’t get into Barrett’s voice or his lyrics. I gave the album a good few listens and I couldn’t get past this initial thought. 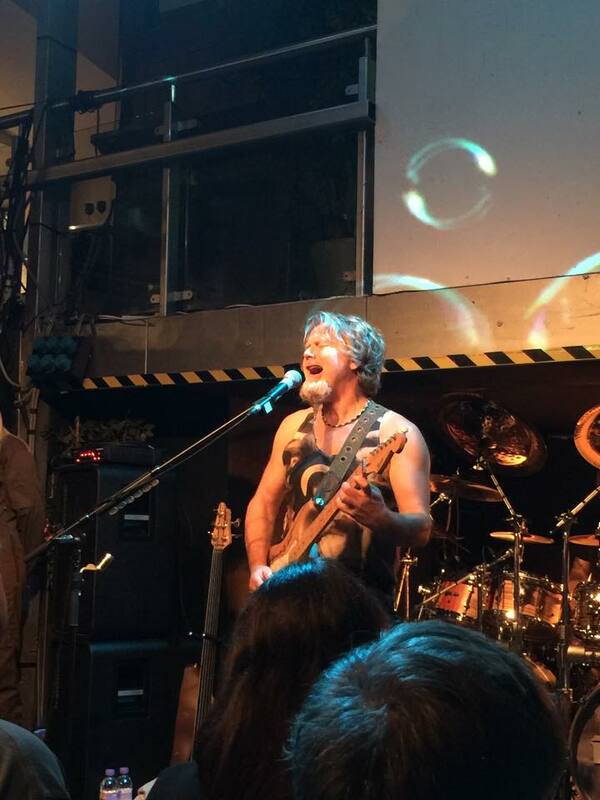 That is until I saw them live … live is where Pendragon thrive! The Ferry is a rather unique venue in Glasgow — it is intimate while retaining an open, airy quality with a balcony that surrounds three quarters of the lower floor where the stage is situated. I was able to stand in the third row and soak up both the sound and the action on stage. From this vantage point it became evident that Barrett’s apparent shortcomings as a vocalist were more than overcome by his musicianship and that of the band. They could play and play they did … two hours of wonderfully engaging neo-prog. By the end of the set my initial reservations regarding his voice had all but evaporated; here was someone giving his all to entertain, and entertain he did. Pendragon are a tight unit. Their timing was impeccable and their willingness to perform, to give their all, was greatly appreciated by the fans who had made the effort to see them — folks coming from as far as Inverness or Dunfermline. They are also very talented; their showmanship was eagerly lapped up by the crowd. Barrett was an engaging frontman, taking time to talk to the audience and, more importantly, listen to and interact with the audience. He also played a mean guitar. Peter Gee played some serious bass and complemented both Barrett’s acoustic moments with a twelve-string acoustic guitar and Nolan with additional keyboards. Gee was very impressive, as was Craig Blundell on drums. Blundell’s frenetic playing left me speechless on more than one occasion, and his solo was spectacular … five minutes of sheer, unadulterated drum madness that Neil Peart would have been proud of. Clive Nolan on keyboards was a safe pair of hands, keeping everything together, providing vocals and a zingy synth as and when required. His novelty move of swinging his keyboards right round was fun and added to the steady movement on the stage. As well as tight and talented, Pendragon are also smart — they have drafted in two backing singers to supplement Barrett’s voice and give an added dimension to the band’s sound, a dimension that Barrett commented on when introducing the pair. Their inclusion was warmly welcomed by the audience, although I have to say I am surprised no one broke their neck slipping on the drool coming from some of the male audience members. While I couldn’t name all the tracks played, I am aware that it was not a gig solely intended to flog product. Yes, they did play tracks from Men Who Climb Mountains (which I appreciated, because that was all I was familiar with) such as “Explorers of the Infinite” and the delightfully raucous “Beautiful Soul”, but they also played their “classics” too: “Paintbox” from The Masquerade Overture, for example. I enjoyed this gig and will be happily looking for more from Pendragon. My initial reservations of Barrett’s voice are all gone — as I listen to Men Who Climb Mountains all I can see is a group performing their hearts out to an appreciative crowd, which helps me to fully appreciate the album. When it comes to live music, I cannot ask for anything more! I wish people would just leave Nick Barrett’s vocals alone. A perfect singing voice has ruined allot of prog bands for me, It can destroy the entire atmosphere of the music and I have to do my best to tune them out.. You need a vocalist who sounds like a story teller who has experienced what the song is all about and that’s what Barrett sounds like to me.Sure, a perfect voice is great for Pop music when all your saying is Baby Baby I Love you Baby.You can’t criticise Nick Barrett’s voice when we have singers like Bob Dylan around. A relevant point, to be sure.